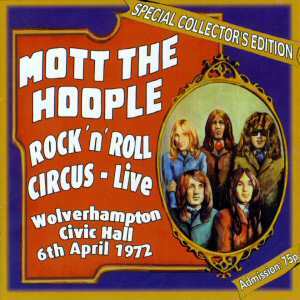 Mott The Hoople CD: "Rock n Roll Circus Live"
As most fans know, Mott The Hoople "split" after a disastrous gig in Zurich, Switzerland in late March 1972. However, they were "persuaded" to fulfil their contractual obligations, which included the "Rock 'n' Roll Circus" tour in April of that month. This is the second gig from that tour, recorded at Wolverhampton Civic Hall. This show has, of course, been issued unofficially (as Island Farewell). I should also point out (as do the sleeve notes) that the source here is still an audience tape, albeit a first-generation tape, the show having been taped on a portable deck sitting on the mixing desk. So although the result is a distinct improvement, Hi-Fi it most definitely ain't. Of course, this means you get a gig almost exactly as the audience would have heard it. OK, so there's a bit of tape flutter, a lack of definition in the sound and little bottom end, but what the heck, ulimately its the performance that counts, and Mott are on fine form here. They'd already met David Bowie, knew that Dudes was a sure fire hit (although they had yet to record it), knew they were leaving their old label, so the future looked somewhat brighter than it had just a few weeks previously. Already the split has been immortalised in The Ballad of Mott as they tease the audience with both old and new material. This is not the sound of a band on the verge of splitting, it is the sound of a band on the brink of their overdue commercial breakthrough. The show includes Hunter's brilliant interpretation of Dylan's Mr Tambourine Man, here as Mr Bugle Player and Mick Ralphs' seldom-heard Till I'm Gone. This is dubbed a "Mott The Hoople Appreciation Society Special Collectors Edition", so it is fitting the rather excellent 20-page booklet is written by MTHAS' own Keith Smith, with a few notes on the recording itself by Uncle Dale Griffin (or "The Artist formerly known as Buffin", as it says here). Ultimately tho' it is for the listener to decide whether the sonic deficiencies I've mentioned outweigh both the performance and the historic importance of this recording. Mott The Hoople die-hards will lap it up, but the casual fan may be less than impressed, as viewed as a proper live release it's bound to disappoint. It should instead be viewed as an "official bootleg" which has been sanctioned by the band and with good sleeve notes to boot (and for which they get paid royalties). Like it says, it's a "special collector's edition", so if you collect audience recordings then this may be for you.